My wife wants to make something in one of her crock pots but the temperature doesn’t go low enough. Testing showed that on low, the crock pot steadily held a little under 150 degrees while she was needing about 115. Looking around online showed that there are several ways of varying the temperature of a crock pot. 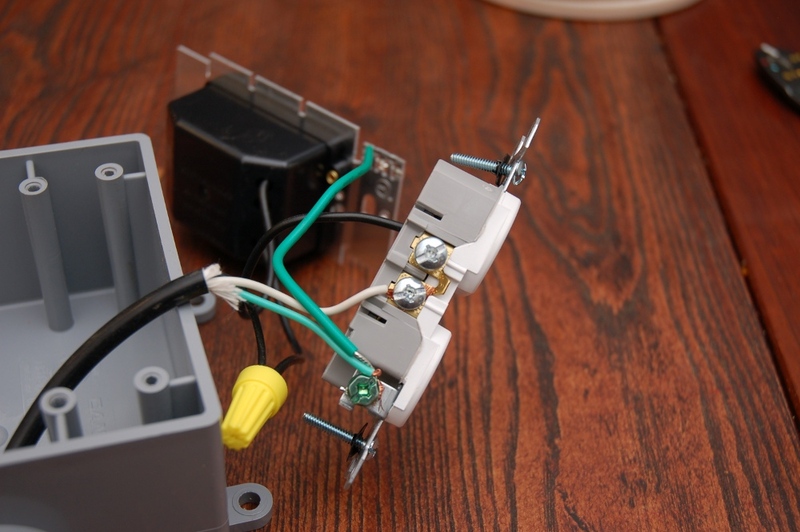 One way is to use a dimmer switch to lower the voltage of the crock pot. The other is a much cooler way which uses a temperature controller. She chose to use the dimmer switch method since it was cheaper and I could complete it that night. I presume that a crock pot is just a resistive heating element. As such, lowering the voltage to it will reduce the heat it generates. To do this, a common household dimmer switch can be used. Modern dimmer switches reduce the voltage by cutting the electricity off for part of each cycle. The lower the output voltage, the longer the electricity was cut off each cycle. 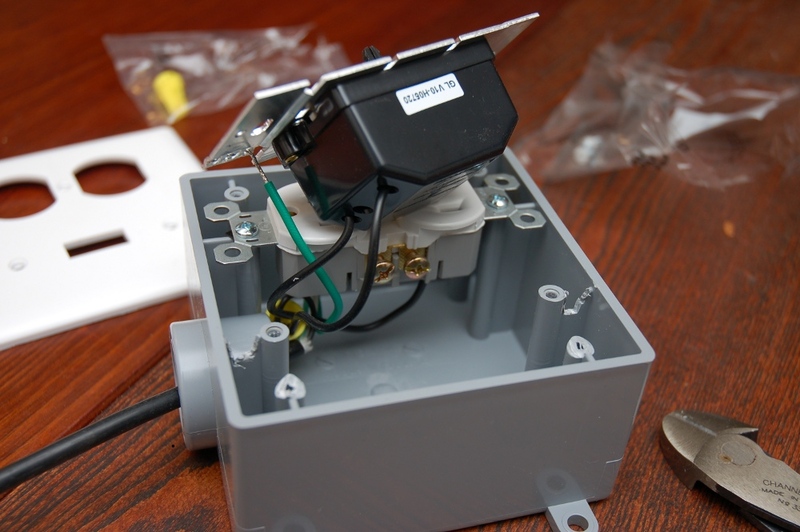 Goto this HowStuffWorks link to read more about how dimmer switches work if you want. To make this project, I used an electrical conduit box, receptacle, cover plate, electrical cord, and a dimmer switch as seen in the picture below. All of these items can be found at your local improvement store. 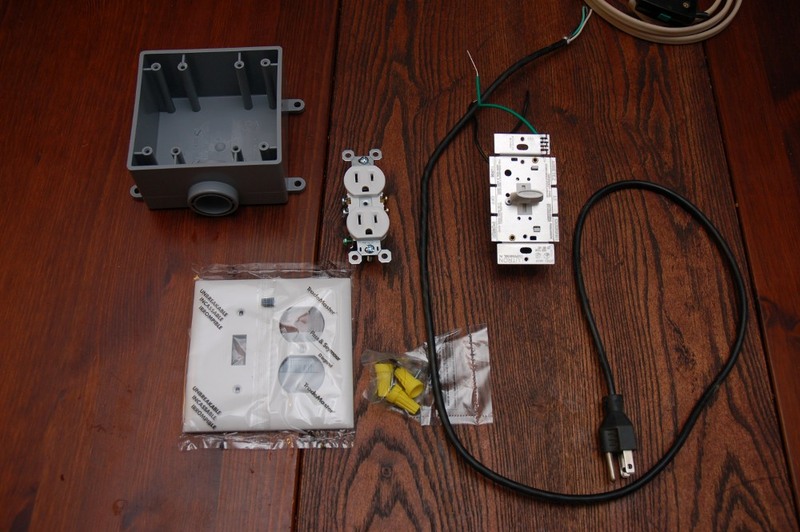 The cord plugs into a regular 120V wall outlet and the crock pot plugs into the receptacle in the conduit box. The dimmer switch is then varied to change the temperature in the crock pot. Wiring it is pretty simple. Hook the neutral white wire from the plug and one of the hot black wires from the dimmer up to their respective spots on the receptacle. Tie the other black wire from the dimmer switch up to the black wire from the plug with a wire nut. Finally, tie the green ground wires together using the screw on the receptacle. Once it is all wired up, double check the connections and install it all in the box. You’d normally want to clamp something on the plug cord in the box to keep a tug on the cord from pulling on the wires inside the box. I didn’t have anything on hand though, so I didn’t. Once it is complete you can test it with a desk lamp. The top picture below shows an output voltage of 27V at the lowest setting and 120V at the highest setting. This varies the brightness of the lamp, but it doesn’t really stand out due to the camera flash. If you look carefully, you can see a difference in the color of the cardboard box. Here is the dimmer box hooked up to the crock pot. As you can see, with the dimmer the crock pot will now maintain a much lower temperature. With the dimmer at the lowest setting, the crock pot held at a temperature around 95 degrees. With a DMM (digital multimeter), we can see how effective the dimmer switch is in reducing the power output of the crock pot. The DMM showed that the resistance of the crock pot is 112.1 Ohms on low and 88.2 Ohms on high. Since the resistive element has a power factor of one, we can calculate the wattage of the crock pot using Ohms law for power which is W=V^2/R. 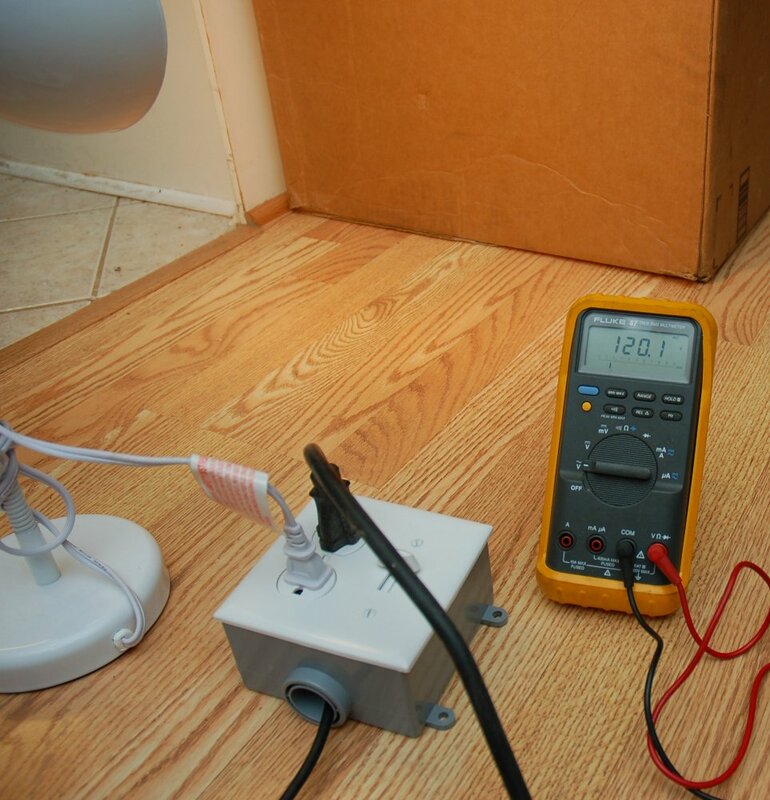 The highest setting on the dimmer leaves the voltage at 120V. This results in the crock pot putting out 128.5 W on low and 163.3 W on high. At the lowest setting of 27V, the crock pot radiates 6.5 W and 8.3 W on low and high respectively. 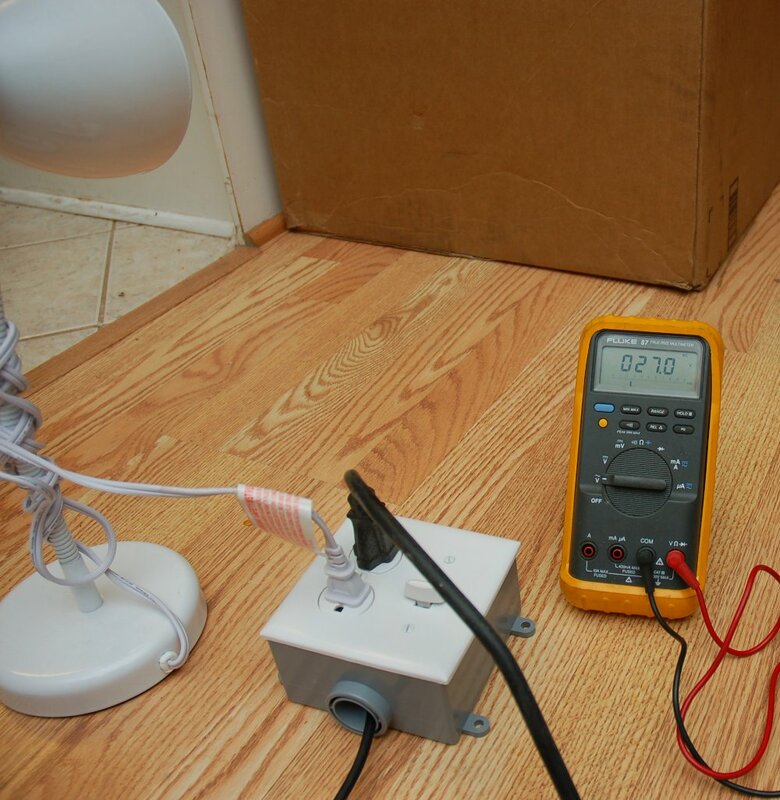 As you can see, the dimmer allows significant control over the power output, and thus heat, of the crock pot. My wife is currently conducting a couple of trials to locate the correct setting on the dimmer for specific crock pot temperatures. To do this, you set the dimmer to a spot and come back hours later after the temperature has stabilized. Mark the switch location and temperature on the cover then increase the dimmer again to find a new steady temperature. 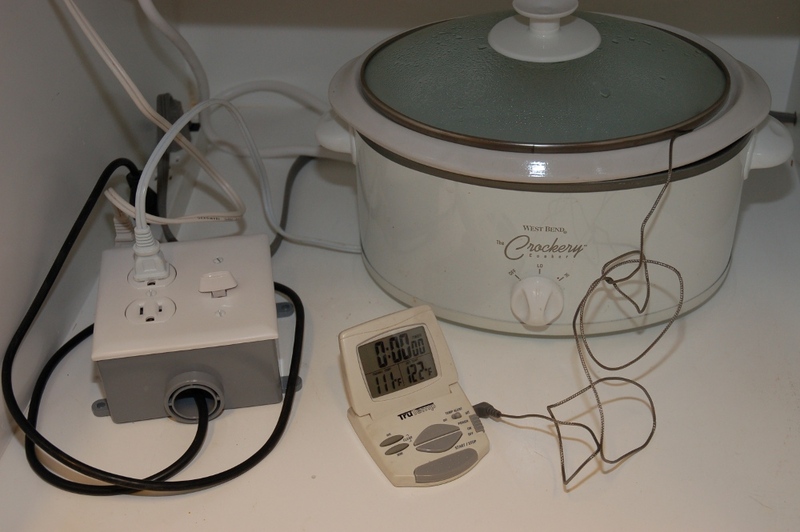 While the dimmer allows control over the final temperature of the crock pot, it has the downside of increasing the time it takes to get to the final temperature if left at one setting since the power is reduced. For example, say you want to reach and maintain 130 degrees. To do this you might set the dimmer to 30%, which you found previously to result 130 degrees. You watch the temperature slowly increase and over several hours it reaches 130 degrees. On the other hand, you could set the crock pot and dimmer on the highest setting until it reaches a close temperature of 125 degrees. Once 125 degrees is reached, you could switch the dimmer and crock pot back to the settings that previously gave you 130 degrees. Doing this would greatly shorten the time it takes to reach 130 degrees. This is how a temperature controller works. It monitors the temperature and makes adjustments to bring the crock pot to your desired temperature quickly. It also continues to switch the crock pot on and off to keep it at the desired temperature. Hopefully, some experience with the dimmer box will result in being able to achieve and maintain the desired temperature easily. If not, then there might be another post in the future with a temperature controller in it! Thanks for posting this just what I need. I bought a new slow cooker several weeks ago (Nov 2012) and it heats up too fast and too hot. The whole idea behind a slow cooker……. need I say more. The old ones never made us sick and the meat came out tender AND juice. I hope to get the same results from your controller. You’ve answered so many of my questions all in one shot. Thanks!!!! While sourcing parts I found the Dork foods http://www.dorkfood.com/ for 100 bucks. Went with this instead and it is really good although as others have noted it clicks frequently as it maintains temp and the clicking is rather loud. That’s pretty cool. I’d thought about rigging something up like that but never followed through. great idea… but you really spent too much time on this. 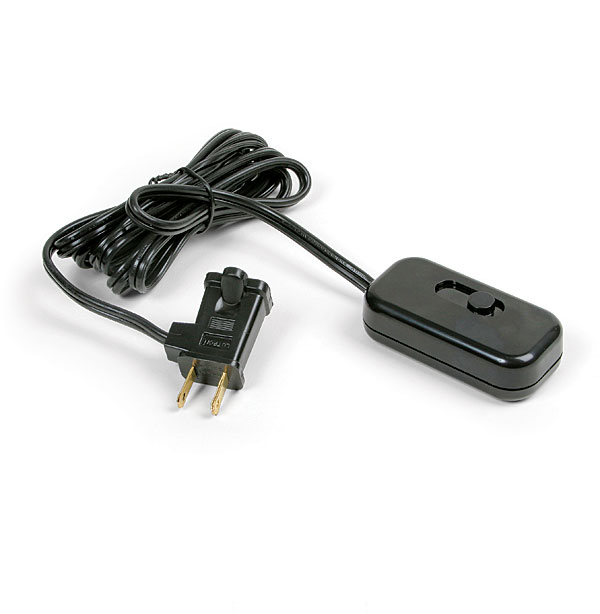 for the same price as the box, switch, outlet and cover, maybe less actually, you can buy an inline cord dimmer. link to picture below. most likely at whatever hardware store you shopped also. A+ for creativity and effort regardless. what is your amp and wattage ratings on the dimmer you used? What about the crock pot? Any over heating concerns? I think the dimmer was rated for 5A 600W. The largest crockpot we have says it will pull 340W based on the tag on the bottom. A medium sized one has 250W on the tag. So, as long as the rating on the dimmer switch is larger than the crock pot you should be fine. I haven’t noticed any heating issues.